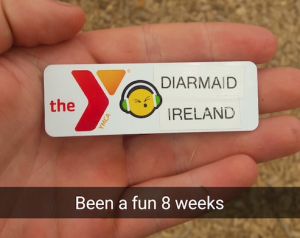 We caught up with Diarmaid Hough, who went to Camp USA as a Camp Counsellor for the first time last year, and he’s here to tell you everything you’ve wanted to know about it. Take it away Diarmaid! 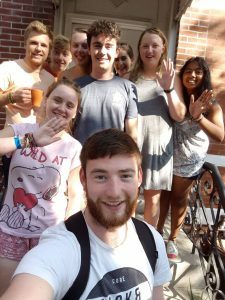 For me, and for many other young Irish people, the Camp Counsellor Visa is an opportunity to experience new things in a different place, to put yourself out of your small, familial comfort zone and really expand your horizons in directions you can’t even begin to imagine at home. After spending a summer over in the States as a Counsellor, I believe that Camp has become, in my mind, the quintessential American J1 experience! Day 1 of Orientation week was a huge shock to the system. You’re surrounded by the wilderness of rural Maine, friendly Americans offering you hugs and high-fives whilst at the same time being unable to pronounce your name. All the while you are immediately being thrown into the communal and social hub-bub of camp life with songs, games and group icebreakers… It took a wee while to adjust. In terms of location, “The Parent Trap” springs to mind as an obvious reference point, but it soon became a place that’s much more than just a movie-esque backdrop. Soccer fields, basketball courts, Art Shack, Library, Archery Range, cabin villages (girls and boys), Dining Hall, Flag, Chapel and, of course, the vast Cobbosseecontee Lake! These names and places became a familiar part of my time in camp. What once was a maze of Pine trees and beaten tracks through the dense wood became old friends and common locations of adventure. 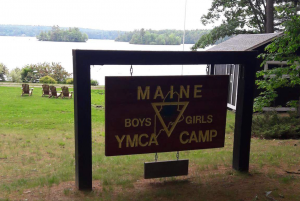 Chapel and Flag represented the main social centres of Camp society; mornings spent contemplating moral lessons under whispering branches whilst seated on creaking benches, and evenings kick-started with the lowering of the American flag to the sound of Camp songs and group performances. Sleepy Winthrop, Maine began to feel not so far away from home. Day-to-day life whilst at Camp followed a uniform and regular timetable. What happened in between however, was a different story. 7am starts and late evenings ‘On Duty’ supervising campers became the norm, but the daily activities and the campers themselves made sure that no two days were the same. Three periods of teaching various sports and classes, followed by an organised afternoon programme lent variety and enjoyment to Camp. 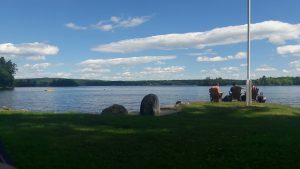 Rugby and Swimming Lessons would be quickly followed by Kayaking or Stand-up Paddle Bordering, while Fort Building and B. O. C. S. (Basic Outdoor Camping Skills) could be combined with Improvisation and Arts & Crafts. Evenings were spent in the Auditorium doing Zumba or watching Lip-Sync Battles, or they were used to host Camp-wide Zombie Runs or games of Pirate Ball. 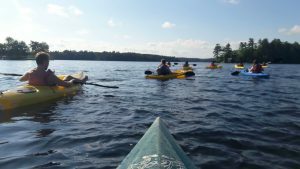 Nothing ever seemed to be repeated, with overnight trips with T. A. C. (Teenage Action Camp) or B. O. C. S. camping trips out onto the lake isles breaking up your weeks activities. It was safe to say any rest you obtained was well needed. For me, however, the main thing which made camp such an amazing experience was the people. Counsellors, junior P. A.s, medical staff, the camp director, the kids, everyone who was there contributed to the experience. This was a place where happiness, joy and love were fostered, enabling the creation of a unique and special environment. A social bond forged from the fabric of Camp values and genuine enthusiasm from all those who occupied that space meant that wherever you were or whatever you were doing, you knew you could trust the people you were with. You could see it in the campers faces each morning. Underneath tired eyes burned an excitement for a new day filled with different experiences and challenges. A sense of pride fills me when I think back at how happy we made those children, and how we helped them develop over a single summer. Camp was a place of adventure and escape, but also a place where relationships and friendships would be created to last a lifetime. Camp is for the kids, but the community and the vibe is for everyone. People who I met at camp will remain close friends of mine for life. Those eight or so weeks in the States will remain with me forever. That first year of camp is truly something else. An experience which will stand to me for the rest of my years. That was truly one of the purest experiences of my life.